During the wonderful weekend, I love getting into the kitchen and cooking for my family (though some of them do not always look forward to rabbit food dinners). Whenever I’m cooking something new, I feel like I’m entering some other culture, if only briefly. This weekend, inspired by a Superfood Gado Gado Salad recipe by Sylvia at Superfoodista, I escaped to Indonesia. The new combination of flavors brought new possibilities to mind, and I had half a mind to start booking a trip to South East Asia. 1. If you’re starting with dry garbanzo beans, soak them overnight. Then, when ready to cook, they will need to boil for 1-2 hours, or until soft to your liking. Season with paprika, cinnamon, and desired amount of garlic. Keep a lid on the pot, at medium heat, and stir occasionally. 2. While the garbanzos are being cooked, you can prepare everything else! Start with steaming the green beans. If you’re starting with frozen green beans, they will need 5-10 minutes in the pot. Stir every now and then. 3. Drain water from tofu container, and slice into cubes. Place the cubes into a bowl, and then pour soy sauce into the bowl to marinate the tofu. Let it soak for 10-15 minutes. Protip: tofu soaks up any flavor it comes into contact with. I could go on for a while about how beautifully versatile the stuff is. 4. Take your brown rice, and either cook in a rice cooker or stove top. Because it’s brown rice, it’s best to use 2.5 cups of water for every 1 cup of rice. It will also take longer to cook–up to 30-45 minutes. 5. While all that stuff is happening, it’s time for the cutting board, yellow squash, and cucumber. I peeled the cucumber and sliced it, then set aside in a bowl for later. I scrubbed and cut the squash into quarters and then sliced it. 6. Once the green beans are done, put them into a serving bowl and set aside. Next on the stove is the squash, sauteed in garlic and olive oil. I did it in three sets, placing the sauteed squash into a serving bowl as I went. Set aside. 7. At this point, the tofu is probably finished marinating. Drain most of the soy sauce before sauteing in a pan. Again, put into a serving bowl and set aside. 8. If you would like a peanut sauce for the dish (which really makes it, so I highly recommend it), I followed the recipe in the post from Superfoodista. I used peanut butter in place of peanuts due to slight laziness (it was late, okay?) but also think that using almond butter might be interesting–go experiment. 9. Once the rice is finished, place into a serving dish. Almost done! 10. Once the garbanzo beans are finished, drain them, and set aside. Lastly, slice the avocado as preferred. And then ladle all of the cooked food into one dish and have a feast! Be sure to get someone else to do the dishes. 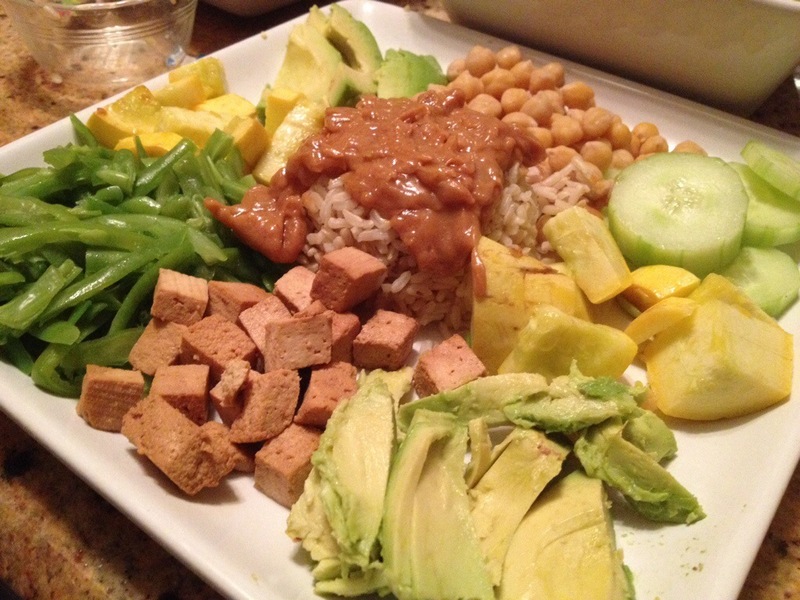 This entry was posted in Dinner with Carnivores, Featured Recipes, Uncategorized and tagged brown rice, cucumber, food blogger, gado gado salad, garbanzo beans, garlic, green beans, indonesian, lifestyle, peanut sauce, superfoodista, tofu, yellow squash. Bookmark the permalink. Thanks so much! It was so much fun to make, and I will probably try making this many different ways in the future, too 😀 it just seems so versatile!